From July 2016 till June 2017, the property prices in Brighton rose on average by 9% which translates to £29k. In order to buy an average property in Brighton, you would need to pay around £336k. For comparison, the average prices in the whole England and Wales rose by 2% or £6.5k. The average property price in England and Wales is now £283k. Brighton is the 30th most expensive postcode area in England and Wales. However, according to Homes&Property, first-time buyers are priced out of 90% of Brighton, which makes it the least affordable city in the whole UK for this group of buyers. The second one, not surprisingly, is London, where more than 50% of properties are out of reach for first-time buyers. According to Lloyds Bank’s Affordable Cities Review from February 2017, Brighton is the 6th least affordable city in the whole UK with the price to earning ratio 9.6. Brighton is also the 4th city with the highest house price growth in the past 10 years - the prices grew by 46% between 2007 and 2017. It was surpassed only by St Albans, Winchester, and Chelmsford, which are all in the South East region. The most affordable place between July 2016 and June 2017 was "BN21 3" - that is the areas of Eastbourne, Old Town, with the average price of £149.000, around 44% of the average Brighton price and 53% of the England and Wales average property prices. On the other hand, the most expensive post code was 'BN3 6' which covers the areas of Hove, Hangleton, and West Blatchington, with an average price of £688k. 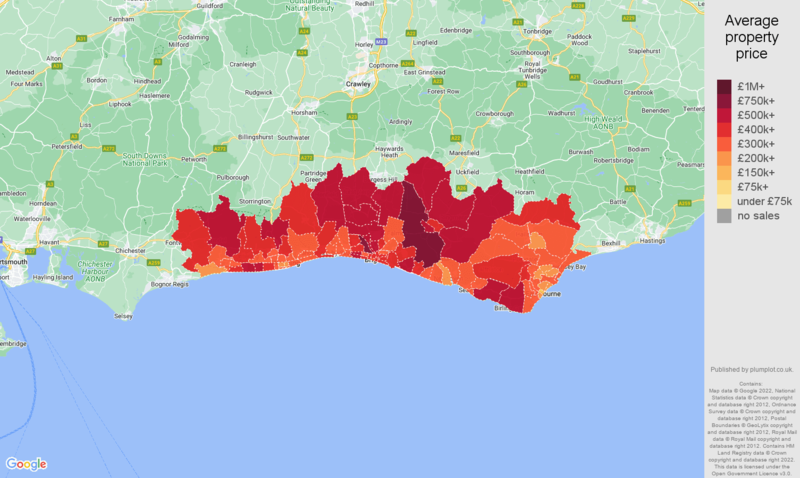 The average price of properties in the BN3 6 area is 205% of the average Brighton price and 243% of the average England and Wales prices. Between June 2016 and May 2017, the total number of sold properties reached almost 14.400. So what were the most popular properties? A vast majority of all sold properties were established properties. Surprisingly, newly built properties hold only 7% of total sold properties, despite the fact that there is almost no difference in the prices. The average price of a home is £348k in a newly built property, £336k in an established property. The most popular property type were flats with 5000 sold which makes 35% of all sold properties, followed by terraced properties with 3.300 sold and 23% market share, semi-detached and detached houses with 21.5% and 20.5% market share or 3.100 and 3.000 respectively. These ratios, as well as sales volumes of newly built and established properties, have been very stable since 1995.